The Design department at the Royal Welsh College is well-known for its amazing oversized props. 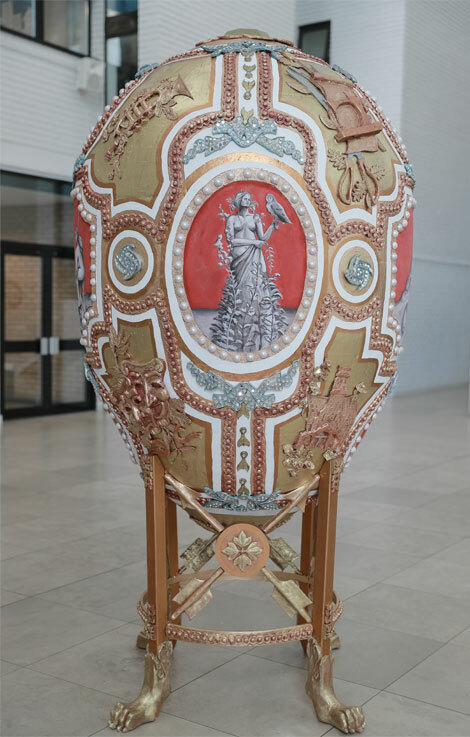 The College’s latest creation is an enormous egg, inspired by one of Carl Fabergé’s eggs, Catherine the Great Fabergé egg. Watch the timelapse video of the egg-making in action below. The exhibition of the egg continues the College’s contribution to Russia’17, a season of events in Wales marking the centenary of the 1917 Russian Revolution. It took 22 first-year Design for Performance students at the Royal Welsh College over 13 days to make the egg as part of their introduction to prop making. The painted panels and ornaments have been changed to reflect a more Welsh theme. Each painted panel depicts a scene from the ancient Welsh Mabinogion stories, and the relief ornament includes symbols of music, theatre, design and the arts. Materials used include polystyrene, latex, steel, wood, PU foam, resins, glue and paint. The egg will be on display in the Linbury Gallery at the Royal Welsh College of Music & Drama from 2 – 26 May. Admission is free. RWCMD tutors Rorie Brophy, Jen Rowlands and MA student Seren Fenoulhet wish to extend a special thanks to the Hillwood Museum for providing excellent photos of the original egg.